We were so happy to be off the dang bikes. We were both worried that something would go wrong on the bike - a flat, a wreck, a mechanical issue, etc. - but thankfully it didn’t. We grabbed our run gear and headed into the changing tent. I quickly changed into running shorts and a t-shirt, put on a hat, race belt, fresh socks and my running shoes. Megan was still getting ready so I sat down and all of a sudden the enormity of the day hit me. We had carried ourselves 114.4 miles...and still had 26.2 to go. I burst into tears and wondered how in the world we were going to finish. I never wanted to quit or felt like we wouldn’t finish, I just hit a real low point thinking of all that we had left to do. But, I knew we could do it. We were on the power of our own two feet at this point plus we could see our family and all of the amazing spectators and volunteers that line the three loop course. A volunteer asked if I was ok and I heard Megan say “first timer”. So we headed out of the changing tent and almost immediately saw Chad, my mom and dad, Michelle and Crystal. I was still sobbing and I told Chad “never let me do this again” “this isn’t fun anymore” “I don’t know how I am going to do this” “Megan was yelling at me” among other dramatic things I’m sure. I was a mess! Megan was saying “she’s fine, she’s fine” and ushered us along. So off we went on our first loop while our family was probably trying to figure out what in the world had just happened. Our goal for the run was to get it done. We weren’t trying to be competitive in any way - just put one foot in front of the other until we got to the finish line. We wanted to run as much as we could, but knew that we would be walking a lot, too. There are many fantastic things about Ironman Texas but the biggest one has to be the volunteers. There were so many volunteers out on the course all day long - they were kind and encouraging and really made the whole experience amazing. The other great thing about the race is the three loop run course and the number of spectators and volunteers along the route. We got into a good rhythm on the first loop of walking the aid stations every mile. I would drink a Gatorade/water mix, then take a few sips of Red Bull and eat a few potato chips. We would then walk for a little bit to let everything settle and then run as much as we could until the next aid station at the next mile. On the second loop we were feeling much better and were able to run more than we did the first loop. I did have an unfortunate 15 minute port-a-potty stop...I kept hearing volunteers ask Megan “is she ok?” Ha, thankfully I was. Megan also witnessed someone fall down a flight of stairs while waiting for me. Thankfully that lady was ok, too. Once I finally got out of the port-a-potty we were able to move at a slightly faster pace and before I knew it we were passing our family and about to start loop 3. We told them that the next time we saw them would be at the finish line! And we also gave Chad and Crystal Which Wich orders to pick up for us for after the race. On the third loop, we reveled in the fact that every step was our last on the course. I also started getting pretty dizzy, but I heard someone tell another runner “don’t look at the ground, you’ll get dizzy” so I tried to keep my head up, looking forward. It helped! We made our way around the last loop, talking with other competitors and running when we could. It was incredibly surreal to know that we were about to finish! On the last loop, instead of continuing on to the waterway to start back out on the run course, you cut back up to the street level and head into the finishing chute. Once we hit the chute, all of the pain melted away (although you wouldn’t know it from my finishing pictures) and we started making our way down the red carpet toward Mike Reilly. We saw our sister Michelle, my parents and Megan's girlfriend Crystal. Then I saw Chad - pretty far down from the finish line. I started waving my hands wildly for him to move down toward the finish line so that he could get our finish on his GoPro. Turns out the video of our finish is available on the Ironman website so the wild hand waving was really not necessary...but I was basically not in my right mind at this point. 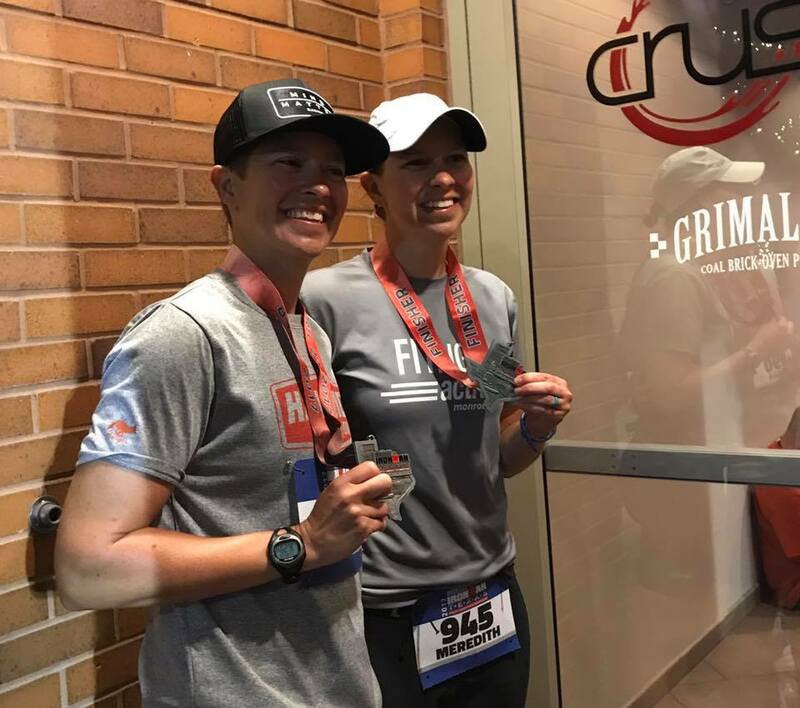 We passed Mike Reilly and he said what we had been waiting to hear all day - “Megan Thornell, Meredith Brooks...you are an Ironman!” We finished in 16 hours and 20 minutes with our hands clasped together raised over our heads like we had planned to do. As soon as we crossed the finish line, volunteers put medals around our necks, handed us our finisher’s hats and shirts and wrapped space blankets around us. We then took a few finisher’s pictures and I made my way to pick up our morning gear bags while Megan met up with the family. By this point (I think it was around 11:30pm), it had gotten pretty cold and windy. We tucked into the doorway of Grimaldi’s for hugs and pictures and then started making our way to our cars. Chad, Megan, my parents and I headed back to the hotel while Michelle and Crystal headed back to Clear Lake. For the 5 minute ride back to the hotel room I laid in the back of my Jeep. not really believing that it was all over. Once we were back in the hotel room I drank a big bottle of coconut water and ate a BLT from Which Wich that Chad picked up for me. My phone had 100 Facebook notifications - crazy!! It was so wild to see how many people had been tracking us throughout the day and saw us finish on the Ironman live feed. I am still blown away by the support I have received from family, friends, co-workers, church members, etc. over the past few weeks. It has been amazing! After doing a quick Facebook check, I took a shower and went to sleep. I feel asleep pretty quickly but woke up several times throughout the night in a daze. By 6:30am I was wide awake and felt like I needed to get my legs moving. I texted Megan and my parents to see if they were up (they were...we come by our early rising naturally). We decided to meet downstairs for breakfast at 7:30, but I hobbled down to my parent’s room first for some prescription strength Advil. After breakfast at the hotel, my parents headed home to Clear Lake while we headed to Ironman Village to purchase finisher’s gear. It was wild walking along where the finish line had been just a few hours earlier...Chad didn’t even recognize that we were in the same place! After buying a few more shirts, tanks, bottles, mugs, etc. (...I may have gone a little overboard with the merch!) we headed back to meet up with Kevin from Cycle Chauffeur. Megan bought this service for us and it was AMAZING! Generally either you or a family member/friend has to pick up your bike and gear bags the night of the race, but with Cycle Chauffeur, Kevin picked up our bikes and bags and all we had to do was pick it up on Sunday morning. It was a major stress reliever and I highly recommend his services. Next we headed over to Lululemon to check out the tattoo situation. Unfortunately, they were running about 30 minutes behind so we decided to head back to Clear Lake. On the way home, Chad and I stopped at Taco Cabana for breakfast tacos. A must when you are in Texas. Once back home, I went through all my gear, got laundry going and laid down on the couch. “No Country for Old Men” was on and I fell asleep right about the time Woody Harrelson experienced the business end of Anton Chigurh’s cattle gun (spoiler alert). After a 30 minute power nap, I got up and got ready to head over to Megan and Crystal’s house for a pizza/pool party. We arrived to an amazing spread of Double Dave’s pizzas and pepperoni rolls. Anyone who grew up in Clear Lake knows all about the wonder that are Double Dave’s pepperoni rolls. After eating, we spent some time in the pool and hot tub. The warm water/cold water combo really helped bring some life back into my sore legs. The next morning (Monday), Chad and I packed everything up, said our goodbyes and headed home to Monroe. It’s hard to put into words how I felt when we were driving home. I was relieved to know Megan and I had accomplished a huge goal, but also sad that the whole journey was over. Ironman Texas has been a daily part of my life since June 2016 and now it is gone. A little bit of “post Ironman blues” set in, but I knew this was to be expected. But much like in an Ironman, the key is to keep moving forward! Megan and I are already looking forward to doing the River Cities sprint triathlon in August together. New addition to the Jeep before hitting the road! We arrived home to this awesome sign from our friends and neighbors the Rileys!